As with other areas of baseball research, there are many books, articles and newspaper stories available about umpires that will provide insight into their world and the history of the job. This is especially true when the researcher is interested in stories about umpiring rather than biographical information. However, for factual information, the best source now is the Internet. Although research on umpires is less complete than players, much research has been done on biographical and professional information regarding the umpiring community and that information has been made available via the Retrosheet website. Retrosheet is the primary source for the work that has been done on umpire biographical information. This website has individual pages for each major league umpire, which shows birth and death date and place, cemetery information, and height and weight. In addition, there is information about the arbiter’s time in the big leagues, showing years, leagues and number of games worked. There are links to other pages that show the daily record for the umpire. The main page also shows a yearly total of ejections made by the umpire. This information has been collected from many sources, including newspaper box scores, and is the single best place to find the most up-to-date factual information available on an umpire. Retrosheet also displays one primary piece of information for many arbiters: the card kept by The Sporting News on the person. Images of those cards, which date from the early 20th century through the mid-1980s, are available for viewing at Retrosheet. Those cards show yearly minor league assignments, as well as biographical information. On many cards there are notations about spouses and children. Retrosheet links to biographies written as part of SABR’s Baseball Biography Project, another important source of material on baseball people. Retrosheet also shows each year’s umpire roster on the pages devoted to a summary of the year. These rosters, as with all Retrosheet umpire information, show all people who worked, not just the staff umpires. The MLB website also contains short biographies of each current umpire. These are little more than a short list of facts but come from the person himself. The MLB website also has information related to the history of major league umpires, including a timeline of facts related to the umpiring community. One set of information that is exclusive to the MLB website is short biographies of each of the people who work in umpire administration for MLB. All of the umpire information on the website is also contained in the Umpire Media Guide, which is published annually by Major League Baseball. A related web site belongs to Minor League Baseball. This organization is affiliated with Major League Baseball and its website is operated by the same organization that operates the MLB site. There is a separate, related group, the Professional Baseball Umpire Corporation, which oversees all aspects of the minor league umpire program, including assignments, evaluations and promotions. The PBUC section of the Minor League Baseball website includes information on how to become a professional umpire, training camps run by organized baseball, the umpire schools from which PBUC hires its umpires, a short history of umpire development and short biographies on the PBUC staff. SABR’s BioProject is compiling newly written biographies of baseball people, including umpires. These biographies present a better picture of the person that mere facts can and the site is a good one-stop location for biographies of many different people associated with the sport. Baseball-Reference.com has a "Bullpen" area that is a Wiki-type collaborative effort. Among other topics covered in this area, there are pages devoted to some umpires. Much of the information shown has been taken from Retrosheet, but a lot of the information is out of date. A researcher should look for independent confirmation of anything shown here, a trait common to all Wiki-type web sites. Another interesting source of information is The Deadball Era website . This site proclaims that it is dedicated to deceased major league ballplayers. However, there is also a lot of information concerning umpires here. Among other information, there are lists of grave site locations and obituaries available here. The site also has photos of some grave markers. The umpires are harder to find in this section, as all photos are listed together and not split into categories, as are other sections. The umpires union has its own web site at WorldUmpires.com that is devoted to news items but also has some other data. The information here tends to be more out of date than other sites but a researcher can find some interesting stories here occasionally. The National Baseball Hall of Fame website lists the people elected to the Hall, including umpires, and shows the current rules for election. There is no detailed information on the Hall of Famers on the site. The Hall of Fame Library keeps folders of information and clippings about baseball people, including umpires. This could be a good source of stories and facts on umpires. The monthly magazine Referee publishes stories about umpiring and umpires. The publication contains stories on rules, mechanics and techniques, as well as features on the people in the profession. It can be found online at Referee.com. There are many biographical books available about umpires. These can be found by searching at most book seller’s websites. Bruce Weber published a book in 2009, As They See ‘Em: A Fan’s Travels in the Land of Umpire, which is a look inside the umpire community. There are also many books by umpires, some looking at the job and some which simply tell stories. 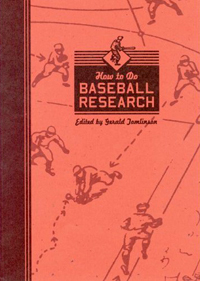 Books and articles in periodicals can be found at SABR's The Baseball Index database, which is searchable. Using appropriate terms, such as “umpire” and “rules,” will produce a list of citations where such terms can be found. Unfortunately, contemporary media seem to cover umpires only when there is a controversy. There is little written about arbiters except when there is a questionable call or an ejection. There are occasional stories written about the people behind the mask, but these are rare. Major League Baseball’s website does contain some pieces about the charity work being done by the umpiring community. The official charity of the umpires’ association is Umps Care and its website contains stories and photos of various events run by the charity at children’s hospitals. These pieces present a different view of umpires, one that helps present a complete picture of the umpiring community. Especially helpful is the fact that there are many photos of the umpires at the hospitals. There are many other resources available regarding amateur umpires, but these are not covered here.